The story begins in the late 1960’s and follows a student Watanabe Toru, played by Death Note actor Matsuyama Kenichi, as he moves to Tokyo to start University leaving behind Naoko, Babel (2007) nominated actress and model Kikuchi Rinko, the girlfriend of his best friend who for no apparent reason committed suicide. Two years later, after a chance encounter Watanabe visits Naoko and sleeps with her, but any escalation of their relationship is halted when she is sent to a sanatorium in the countryside because of her deteriorating mental state due to the earlier suicide and thereafter refuses to see him. After a string of casual encounters he starts a romance with a pretty emotionally uncomplicated student named Midori, played by American born Mizuhara Kiko in her debut film, but this relationship founders as he finds himself unable to forget Naoko. When he finally visits Naoko again at the sanatorium, this encounter prompts intense soul searching and confessions leading ultimately to tragedy! It took several years of negotiations between Vietnamese/French director Tran Anh Hung and Haruki Murakami author of the novel adapted for Trans latest screen offering Norwegian Wood (2010). The reason these negotiations were so protracted was that two of his novels had been previously adapted and it has been reported that he was not happy with them; especially the 1980 film Hear the Wind Sing. 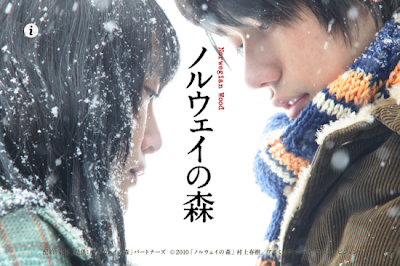 The other movie was Tony Takitani (2005) (see link below), which I feel is similar in tone to Norwegian Wood. The script for this nostalgic story of loss and sexuality was firstly written in French than translated into English for the directors dealings with Murakami who provided extra dialogue especially for the film and then finally into Japanese for the cast, a language that Tran does not speak! The movie is beautiful to look at, lovingly filmed by Mark Lee Ping-Bing who did the same for In The Mood For Love (2000), wonderful colours and visual detail. The musical score is by Jonny Greenwood a member of the English alternative rock band Radiohead who also did the score for There Will Be Blood (2007). My only criticism is that the film can be a little measured at times but I think a second viewing would probably help with a better understanding of a quite deep and meaningful story.